I feel a little awkward reviewing this book. First off, I listened to it on audiobook, which usually knocks a book down a little bit anyway because I get distracted by traffic and sometimes feel like I’ve missed parts of the story that might have affected my opinion of it. That’s reader error and all on me. I also found myself taking “breaks” from this audiobook, finishing a cd of the book and then popping in music for a couple of days before forcing myself to go back to the book. I think that was the book's fault. 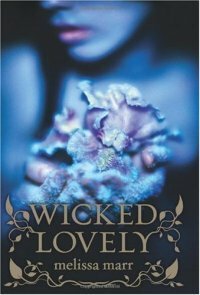 There’s nothing inherently wrong about Wicked Lovely. The main protagonist is not incompetant or annoying, though I wouldn’t really describe her as strong or all that smart either. She doesn’t have any annoying overly bubbly or quirky sidekicks. The guys in the book are actually nice people that I would be willing to be in the same room with, even if one of them is a faerie king. The bad guys were clearly drawn and over-the-top to the point of silliness, but not in a bad way, more in a proper faerie tale sort of way. Things happened at a fairly regular pace. On the surface, this is a down-the-middle okay YA supernatural title, so why did I find myself constantly wanting to listen to anything other than this book? I’m blaming the narrator. She was wonderful at distinctive character voices, but her actual narrator voice struck me as being better suited for Shakespearean plays than YA titles. There was something to the way she over-enunciated everything that drove me a little crazy at 6:30 in the morning. And in the middle of the afternoon. It just didn’t match up and the story wasn’t fantastically interesting enough for me to get beyond the grating narrator. Our main character, Aislinn*, is a teenage girl who happens to be able to see all the faeries that live in her small town. Because this is a bad thing, she pretends like they aren’t there and becomes friends with the attractive loner boy who lives in a train (which I thought was a pretty cool idea) because faeries can’t stand steel. One day, a gorgeous boy faerie starts stalking her because he’s convinced that Aislinn is the queen he has spent 900 years looking for; she must agree to be his queen for him to obtain his power as Summer King and end the nasty rule of his mother. The rest of the story goes along as you’d expect given that set up, at least until the very end. Somewhere around the last disc, things got interesting and I perked up. Then it ended. And I got frustrated. As I said before, Aislinn is a fair female protagonist. She’s not all that strong, but she’s also not completely powerless. She makes her own decisions and choices, but she also makes some really stupid choices that made me yell in my car. For someone who has seen faeries all her life, she didn’t act like she knew much about them – particularly the bit where you should not eat or drink anything they offer you because very bad/odd things will happen to you and you’ll wake up somewhere else, not remembering what happened. I think that incident alone colored her character for me. That was the biggest, dumbest thing a girl in a book about faeries could do. But then there were the boys. Because this is a supernatural YA title, there are two of them and they both vie for Aislinn’s affection. Seth, the guy who lives in the train, is unusual for a male romantic lead. He’s a bit goth with piercings all over, though he is also ultra-sensitive and overly affectionate at times. Of course he’s madly in love with Aislinn, and she doesn’t know it, but at least he’s worthy of having his affections returned. He is a genuinely nice guy, who cares about her well-being and makes sacrifices to protect her. Keenan, the faerie Summer King, is a little off as a supernatural being normally is in the human world, but he’s believable and his intentions are never malicious. He’s not the bad guy even though he’s trying to steal the girl away. He also wasn’t all that interesting, much as with the other characters. His female counterpart, Donia, was far more interesting, trapped under the service of the evil Winter Queen while still in love with Keenan. I would have prefered the book be about her. She had layers to her that were just barely explored. To be honest, I don’t have anything really to say about this book. It was… okay? Boring? Predictable? I don’t know. It wasn’t bad and other than a few stupid moves by the protagonist, nothing annoyed me. It just wasn’t note-worthy. Can’t say I’ll be moving forward with this series, though I might cliff-note it through Wikipedia. * Perhaps it wasn’t the narrator. Had I read this in book form, the spelling of that name would have driven me just as crazy as the narrator’s voice. This book was not written for me.